Many Dynamics independent consultants are well connected and have great access to a number of specialised networks and groups. However, there are some aspects of being self-employed that are often at the back of our minds and not well covered in Dynamics social media. These are often important things like getting started, opening a company, local tax & legal advice (especially how to avoid an IR35 enquiry etc), insurance, finding an office, and so on, which frequently come up in casual conversations. It is very useful finding a professional body to guide you through these areas so we have decided to list some of them. The Association of Independent Professionals and the Self-Employed (IPSE previously known as PCG) – https://www.ipse.co.uk/. This is the largest organisation for independent professionals in Europe with over 21,000 members. You get fantastic benefits in terms of advice helpline, insurance, free use of workspaces in London. Freelancer & Contractor Services Association (http://www.fcsa.org.uk/). One of the leading trade association for accountancy service and umbrella providers. If you want someone to do your bookkeeping & issue invoices on your behalf, this could be a good choice. Their members, bookkeeping organisations, are seriously vetted and highly reputable. Freelancers Union (https://www.freelancersunion.org/). They have 244,000 members in USA. The benefits are mainly focussed around insurance, medial and retirement offers. Association of Independent Information Professionals (http://aiip.org ) helps with getting started, networking and events. Association of Independent Consultants (AIC) (http://www.aiconsult.ca/). Personalised service that gives access to networking, events and members discounts. 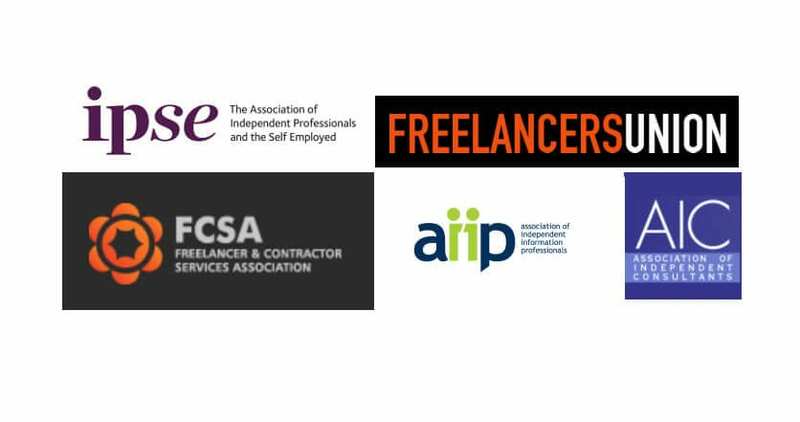 There are many others and I’ve probably missed some major independent organisations who provide practical support to freelancers – please comment/reply with any other companies that are worth adding to the list.